We venture outside of the downtown area for this neon sign, located on Avenue E, Ensley between 22nd and 23rd Streets, Ensley. 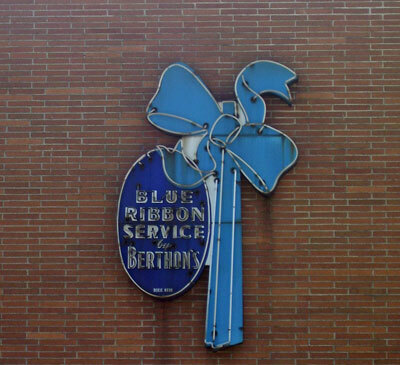 This sign hangs on the Berthon Cleaners location on the west side. Click here to view a history of this Birmingham based business. I’ve discovered that several signs are not being turned on this summer. Not that I blame them, though it just means that we’ll have to go back in the fall and showcase the light show then. This will hopefully be one of those signs. There are other neon signs posted on the web, courtesy of the Magic City Flickr Group. If you know of any other signs and feel like taking pictures, submit them to the group. It’s free and easy to join. Of course you can e-mail me your suggestions for signs by clicking here, visit the main page of the series by clicking here, and visit the photo gallery by clicking here. And check out the first part of the Chicago series from this morning.